A goal of ADTPro is for the server to remain compatible with the vast majority of ADT and ADT-derived clients currently in use, while providing a superset of functionality in its own client. Below is some information about what capabilities lie where. 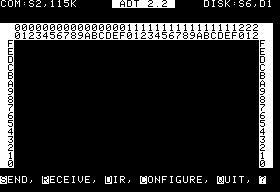 Generally speaking, the client program (the part that runs on the Apple II) for any of these programs is compatible with the ADTPro server. Version 1.0.4 of ADTPro started shipping with a new offshoot of the original ADT client, based in part on the 1.33 version and in part on the A2V2-embedded version. 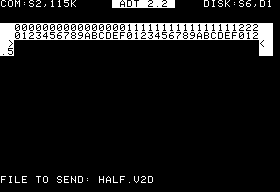 The result is a superset of all the function that came with the latest historical ADT client, plus the nascent nibble/half-track extensions from the A2V2 project. 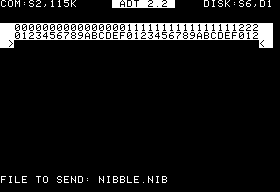 The Nibble extensions have since been incorporated into ADTPro, and the versions of ADTPro after the v1 line will no longer include the DOS-based ADT client. ADT versions 2.3 and later introduce nibble and half-track disk extraction. Half-track capability is only present in the ADT client (i.e. the ADTPro client only has nibble capability). The Virtual ][ A2V2 server is the only server that can actually reconstitute disk images based on these technologies so far.